As far back as I can remember, I have always been a Wrestling fan. I blame my father for this, as I blame him for my life long love of the Yankees. Many a summer night was spent watching WWF's Spanish broadcast on channel 41 along side my dad. Sometimes we'd get into mock wrestling matches which my mom would referee in, or interfere with. Which, always depended on with dinner was ready or not. It was no surprise to either of my parents when I started requesting all manner of wrestling toys. I wanted the LJN giant rubber wrestlers like the boy next door, but as always, finances dictated I got an armful of poorly articulated He-Man looking, knock off wrestlers that kinda, sorta looked like Hulk Hogan if you squinted long enough. I didn't mind. I was used to accepting "good enough." That changed when Mattel released a commercial featuring Millions of Unusual Small Creatures Lurking Everywhere. 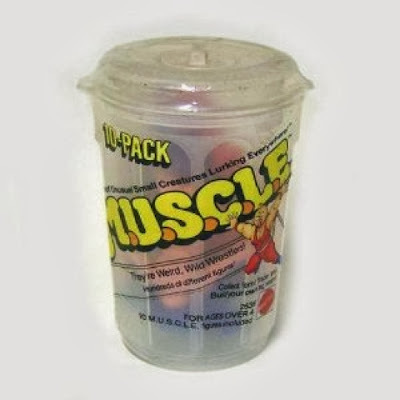 M.U.S.C.L.E as they were commonly called were tiny pink hard rubber figures. They came in 4 packs, 10 packs, and 28 packs. Not much was known about them other than they were weird looking and there was a wrestling ring accessory, so they were wrestlers. It felt like overnight, every boy in my class has a handful of these things in their pockets. Since I never quite click with the girls, I was essentially "one of the guys." This meant I had to get some to join in the playground reindeer games. I showed my mom a 4 pack at Woolsworth the very next time we went shopping. I explained they were wrestlers and that everyone had them. My mom took one look at the package and asked if I wanted some. I said yes. My outrage lasted a full New York minute until I heard my mom say it was a better value to buy the 10 pack. I got home with a little plastic trashcan full of wrestling goodness. I open it up and the first thing I find is a hand. An ugly bumpy hand. Huh. I pull a few more out, and one looked like an oil drum with arms and legs, and there was one that looked like that Apple II we just got in our classroom that even our teacher was afraid to touch. How are these guys wrestlers? A few of them resembled humans, and those passed as wrestlers in my world so it wasn't a complete bust. I ended up trading the weirder figures to some of the guys in class, in exchange for their more human looking guys. In the end I ended up getting those weird guys back, as my mom would buy me a couple more 10 packs before the novelty wore off (long before the mixed color figures came out) and I and every other child moved on to the next big thing. Late into my teens I would still find loose M.U.S.C.L.E. guys in random places in my room, in a jewelry box, under the bed, in an old coat pocket. Every time that would happen, I'd get a stupid look on my face and just smile for hours. I only kept one of my original guys, MY world champion, "Macho Kid" (Terry man to those Kinnikuman fans out there) and he still makes me smile.